Pictured: A machete fight. Not pictured: Redemption. 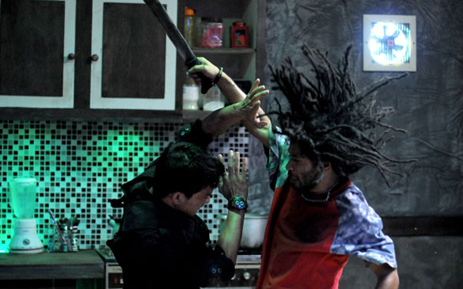 The Raid is a film that consists largely, in fact almost solely of people fighting. This is both its biggest weakness and its greatest triumph, depending entirely on what it is that the viewer wants from the film. If you are looking for a film full of memorable characters, crackling dialogue and emotion that extends beyond, "Ow, I have just had my spine broken and I'm pretty upset about it oh I'm dead," then the film will probably leave you wanting. If, on the other hand, you want to see a film that offers non-stop visceral excitement with minimum fuss but maximum fun, then The Raid is absolutely the film for you. Set almost entirely within the confines of an apartment building located in part of a Jakarta slum that has long since fallen under the control of the local gangs, the film begins when a SWAT team is sent in to apprehend Tama (Ray Sahetapy), a drug lord who has been renting out its rooms to wanted members of the local underworld. Among the members of the team is Rama (Iko Uwais), a relatively junior officer who is condescended to by Lieutenant Wahyu (Yayan Ruhian), the man who ordered the raid in the first place, even though Jaka (Joe Taslim), the leader of the team, thinks that he is more than up to the task of helping to conduct a relatively simple operation. After successfully infiltrating the building and making it to the fifth floor (of thirty) with relatively little incident, Wahyu shoots and kills a young boy acting as one of Tama's sentries, though not before the boy is able to get warning to Tama himself. Using the intercom system and his comprehensive surveillance set-up, Tama makes an offer to the denizens of the block; anyone who helps to kill their visitors gets to stay rent-free. With that, all Hell breaks loose, and the surviving members of the team are forced to battle their way through swarms of armed criminals in order to complete their mission, or even just to survive. In terms of plot, the first paragraph of that synopsis sums up the first ten minutes of The Raid, whilst the final sentence of the second paragraph sums up the remaining eighty. Once director Gareth Evans has managed to get his characters into the apartment building, and once the people inhabiting it have been made aware of their presence, the story pretty much stops, apart from some small character moments along the way and a brief denouement. The rest of the film consists of expertly choreographed fight sequences, and the great joy of the film is the way in which Evans and his crew make each feel distinct, giving each fight its own internal narrative and style. Sometimes the men are involved in harrowing and tense firefights, sometimes they fight hand to hand, and on one memorable occasion, they do battle with machetes in an incredibly tight corridor. As the film progresses, Evans seems to enter into a game of brinkmanship with himself, making each fight sequence ever more dangerous and exuberant, until it reaches the point where you think that the film can't possibly top what has gone before. However, it somehoe manages to do so every time. The fights are incredibly brutal, and Evans' grey, grim aesthetic and kinetic camerawork - at one point the camera follows a character as he leaps down through a recently created hole in the floor, placing the audience in the centre of things in a moment that is both disorientating and thrilling - adds an immediacy to proceedings that both highlights and disguises the choreography on display. The fights are never less than impressive, but they never become so elaborate that they feel unrealistic. This approach makes the fights both beautiful in their construction, yet intensely brutal in their execution. The Raid is at its best when it functions as the jus sauce of action cinema: a narrative that is reduced down to the bare essentials of the genre. Its story is minimalist, but it uses that thin framework to connect together its thrilling setpieces. It comes as no surprise, then, that the times when the film falters are those when it tries to add depth to characters who only need to serve as human punching bags/punching machines. There's a curious sense of disengagement to the scenes in which the characters try to relate to each other on anything other than a physical level, which is brought about either because the actors aren't good enough to convey the emotions required - though, to be fair, they don't need to be great actors when most of their dialogue consists of grunting in pain - or because Evans himself does not have any particularly interest in them, but includes them because they are expected aspects of action films. The problem with these attempts at drama and characterisation is that they are moments of almost painful conventionality in a film that otherwise veers away from convention. Aside from those missteps, The Raid is a hugely entertaining action film that benefits from the contrast between its minimalist plot and the virtuosity of its action set-pieces. Its single location, focused story and relentless pace make the bloat of most Hollywood action films seem hopelessly outmoded in comparison, and we can only hope that the next generation of action directors will rip it off mercilessly, rather than continuing to imitate Michael Bay et al. As a thrill ride, there are few films in recent memory than can boast purer or more ecstatic thrills than those found in The Raid.